A unified and consistent user experience with the various digital apps a group can offer (public website, e-commerce website, mobile online sales, tablets, etc…) is an increasing concern of many large retailers or services companies, so as to effectively brand themselves and leverage a common IT infrastructure. As the world of back-garden-apps is slowly dying, moving towards a analytics-driven and mobile-driven strategies, it is important to deliver new features to all channels in a safe and consistent manner. A less elaborate technique, but probably more mainstream, is to centralise the management and access to the content (CRM) and transactional data (back-end services e.g. 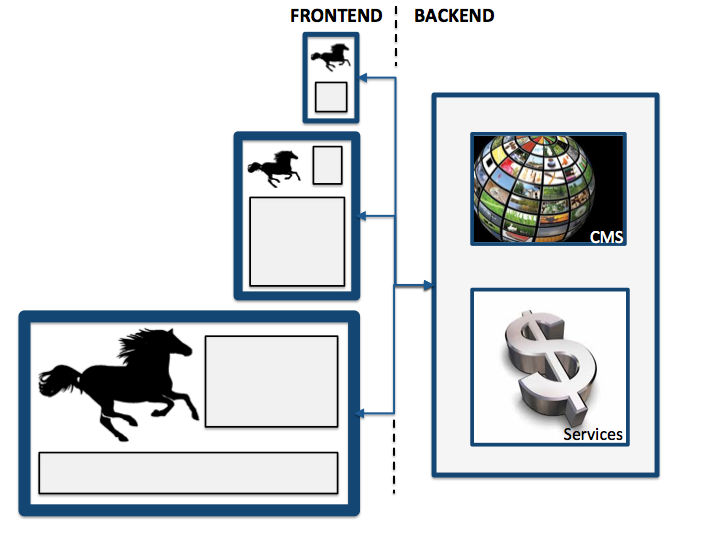 REST or Web API) for your portfolio of digital channels. If you make sure that all apps access the content and business logic in the a consistent way, then it will be easier to provide new products and services without writing a lot of platform specific code. The first if statement initialises the app pool with an always-on mobile display mode. In our case, it meant that the site was displayed in a Facebook app, for which only the mobile mode was suitable due to some Facebook tabs size restrictions. The second conditional block is more interesting. In non-Facebook mode, we set the display mode to mobile only for mobile devices and not a tablets (Note: we used 51Degrees for user agent detection). Indeed, we wanted to use the desktop views for tablets as we purposely designed them to work on them. Hence, the code above pushes the desktop mode to the top of display modes stack, and then pushes the mobile one, which will therefore be evaluated first when a request comes in. With that in place, the only thing left to do was to re-write any screen that did not display correctly on a mobile. 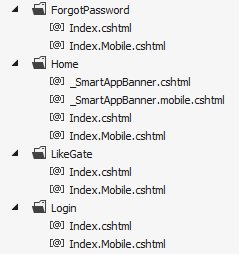 The screen grab below presents some of our project files, showing the desktop views Index.cshtml alongside the mobile ones Index.Mobile.cshtml. This entry was posted in Software and tagged digital strategy, display mode, mobile, mvc4, responsive design by jeandamore. Bookmark the permalink.